This is a special post to my readers who have requested for a chawanmushi recipe. Chawanmushi or steamed egg custard (茶碗蒸し) is a popular Japanese dish, one that is mostly ordered as an appetizer at Japanese restaurants. From the name of this dish in Kanji 茶碗蒸, I believe chawanmushi is originally a Chinese dish, but has since been perfected by Japanese chefs. The Chinese version of steamed egg custard or 蒸水蛋 is a lot simpler, but not as tasty as chawanmushi, in my honest opinion. The reason is very simple: chawanmushi is loaded with treasures that are buried at the bottom of the steamed egg custard while the Chinese version is usually plain! Plus, the use of dashi stock and sake are great seasonings for an otherwise plain steamed egg taste. For my recipe, I used shrimp and chicken–two common ingredients for chawanmushi. Inspired by my favorite Japanese restaurant in Beverly Hills, I also added a bay scallop in each serving. I did it without gingko nuts but traditional chawanmushi recipe calls for them. All in all though, I love chawanmushi and made them two days in a row! It does take some techniques to make them picture perfect and silky smooth (which I am still learning), but am very pleased with the results. *: Ratio of eggs to dashi stock/water is 1:3. The above measurement of water is for reference only. Blanch prawns and set aside. Cut the carrot slices into maple leaf shapes. Blanch in salt water and drain. Cut the chicken into small cubes and marinate in sake and soy sauce for 15 minutes. Put all egg custard ingredients in a bowl and mix with chopsticks and strain into a bowl. Bring a steamer to boil and then set the heat to very low. Divide the chicken, shiitake, prawns and carrots among four ramekins. Divide the egg mixture among the ramekins. Put the scallion on top and cover each ramekin with aluminum foil. Steam on low heat for 15 minutes. Insert a tooth pick into the egg and if it comes out clear, it's done. Those look perfect. Great photo! And the blend of flavors sounds delicious, I will definitely have to give this a try. Bee I love chawanmushi, my mum’s Japanese friend makes it all the time. It has such a delicate flavour. Thanks for the recipe. 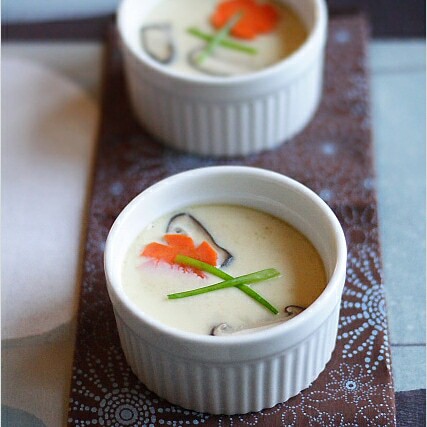 I have already gotten my chawanmushi ramekins ready for this post! Looks good:-) Chawan means bowl and mushi means steamed in Japanese. I’ve found that using bain-marie setup (like making creme brulee) in the oven works well in the texture department. i prefer the chinese style with all the salted egg,preserved egg n etc etc…but this is still just as tempting! That looks good! I have been wanting to try chawanmushi for a while now. My husband and I are big fans of Japanese food…mainly sashimi and sushi, but the first time we tried chawanmushi we were smitten! We love this egg custard! :) Thanks for the recipe! This looks really good!! I’ll try to make it one day. love chawanmushi, love both jap and chinese version. and thanks for sharing the recipe! Love chawanmushi. Never fail to order this whenever I have Jap food. This looks lovely. Just wondering what kind of sake do you prefer to use? Ha! We made savory custards back in July, and were so smitten we had three versions within 48 hours! Know how you feel! Yours look gorgeous. I’ll have to look into the addition of dashi. Chinese egg custard also has little tid bits of goodies on the bottom. My grandmother would make it with minced flank steak and minced dried shrimp. Somehow I have an inkling it might be a recipe for four people. I have this down to a science almost now – I practically live on chawan mushi – it is so delicious. My version is a little over 1/2 cup liquid (dashi stock is a must) to 1 egg. maybe a dash more dashi…(I usually do 1 1/4 cup dashi with 2 eggs) and I would probably fo 11/2 cups and a smidge more with 3 eggs. I add a bit of chicken and shrimp marinated in mirin and soy, and some shelled edamame or green peas to the bowl and steam for about 20 minutes or until done. It is so simple and so satisfying. I have never bothered doing the straining of the egg. I mix it well and I find it smooth enough. It presents best in individual ramekins for serving to guests – but I eat the whole batch myself so I cook it in one big double boiler. My mother taught me how to make this, then I learned a Chinese version from my mil. I think the key differences are staining the egg mixture to give it the silky texture and using high quality dashi for the flavor. The ‘MSG’ flavor comes from seaweed, and dashi is made from seaweed (kombu). Hi all, my chawan mushi is very ugly. It does not have the smooth surface.instead , it looked like the surface of the moon. I use a rice cooker to steam. What did I do wrong? The water/steam of the rice cooker dropped to the surface of the steamed eggs. That’s why. Try steaming method in which you place the ramekin dishes(with the egg mixture) in a pot with some water in it. Then, prior to steaming the egg, you should cover the mouth of the pot with a cheesecloth and then put the lid on top. That way, you won’t have the water dropping into the ramekin dishes as the water simmers. Tried this recipe and the chawanmushi was great! Thanks for sharing the recipe. My Dashi stock is in powder form….how does it work? is it 1/2teaspoon of dashi with 2 cups of water? It is not correct to say that the Chinese version is served “plain”. Perhaps you have only had it plain. Chinese egg custard, depending on the region of China, will have flavor builders steamed with the egg custard base including seafood, sometimes chicken, and vegetables. Both Japanese and Chinese versions are lovely and delicate – neither is better as, in matters of taste, it is ultimately an issue of preference. Rasa Malaysia – try the following if you’re not satisfied with texture. Steam in at high heat for the first two minutes then lower the flame right down for the remaining 13 minutes – keeping the cups cowered of course. For ratio of dashi to egg, I find two cups of cold dashi and three eggs (lightly beaten, minimal bubbles and strained) works best. Thanks for all your other recipes. They have been inspirational. Tried the chawanmushi yesterday and its turns out smooth and delicious. I used only fresh shitake and it has a nice delicate taste of shitake and sake. Hubby and children loves it!! chinese steamed egg is usually eaten with mixed rice whereas japanese chawanmushi can be eaten on its own, that explains why chinese version is simpler and usually topped with salted egg york. Hi, I have planned a Japanese dinner for tomorrow. I will also be cooking using your Oyakodon recipe. May I know if I have interpreted the ratio of eggs to water/dashi stock correctly i.e if I use 1 egg (65gm) then 3x water or dashi stock (65gm x 3). But if I am using water (65gmx3) and dashi powder, how much powder do I use (1/2tsp)? Appreciate if you can reply me. Thanks! Japanese sake, or white wine. Bee, your recipe is intended for how many servings?